« Good Morning From IMS! It was genuine too. Sometimes you see drivers that are so exaggerated when they win a race that it seems disingenuous. I don’t think anyone could say that about Power’s celebration today. This was a well-deserved win and no fluke. He has come close a few times and you wondered if he was going to be one of those drivers like Michael Andretti, Lloyd Ruby, Rex Mays or Ted Horn; that had great careers but never won the Indianapolis 500 after coming close so many times. This was a good race to watch from the stands. As I type, most of you know more what happened than I do. Such is the case when you attend a race in person, versus watching it on television. But from my seats in Stand A, it was a very compelling race. Like the entire Month of May, it was tough to get to get a handle on who had the upper-hand. Ed Carpenter was strong at the first of the race. He led the first thirty-one laps and led the most of the day with a total of sixty-five. But his strength was mostly in the first half of the race. Carpenter only led two laps after Lap 92. Still, he was good enough to finish second. Tony Kanaan had a star-crossed day. He moved up from his tenth starting position right from the start. The first time I looked at the scoring pylon, he was already up to seventh. Then he steadily moved up to second, before passing Carpenter on a restart on Lap 63. Two laps later Carpenter re-took the lead, but Kanaan had served notice. Kanaan looked strong and I thought would be a factor all day. But a cut tire did him in before the halfway point and he was suddenly an afterthought. But Kanaan fought back and worked his way up to ninth at one point. Then it all went terribly wrong on Lap 189, when Kanaan crashed in Turn Two. There were no cautions until Lap 48 when defending winner Takuma Sato and James Davison made contact in Turn Three. That opened the gates for a quick series of yellows. After only four laps of green after the restart, Ed Jones had a hard hit in Turn Two. Again, five laps after the restart – Danica Patrick had an equally hard hit in Turn Two. Finally there was another long stretch of green flag racing for sixty-seven laps. But on Lap 139, Sébastien Bourdais suddenly lost of control of his car in the north chute and slammed the wall in Turn Four. Television probably revealed what happened to the car, but I haven’t heard. I know the replay they showed on the video boards looked like something broke on the car, but I don’t know what happened. After only two laps of green, Helio Castroneves lost it coming out of Turn Four and hit both the outside and inside walls. After only another to laps of green, Sage Karam had a similar looking crash on Lap 154. It was during this caution period that several cars made their final stops banking on a lot more yellows, including Scott Dixon, Oriol Servia, Stefan Wilson and Jack Harvey. Servia led sixteen laps, and you wondered if his tactics would pay off. For a while, it looked like they would not come. After the restart for Kanaan’s crash, it looked to be an eight lap shootout. Wilson and Harvey split Servia on the restart and Will Power soon did away with Servia as well. But Power was having trouble getting past Harvey for second place, while Wilson was pulling away. But Harvey and Wilson peeled off for the pits on Lap 196, clearing the way for Power to lead for four laps before taking his long-awaited checkered flag in the Indianapolis 500. As I said earlier, Power was one of the happiest winners I’ve seen win this race in quite a while. What you saw in Victory Lane, carried over to the post-race press conference in the IMS Media Center. He was ecstatic. This was a popular victory in the stands. 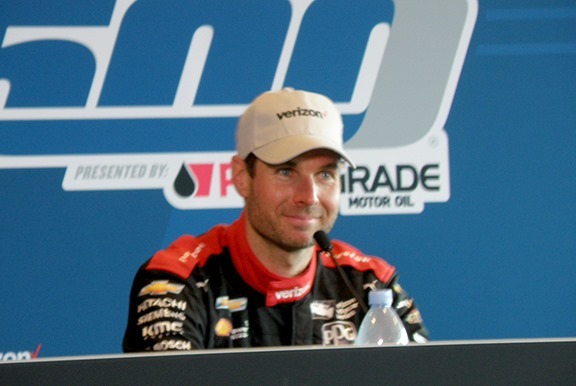 Will Power has won a lot of races in the Verizon IndyCar Series over the years, but this one had seemed to elude him – until today. He has paid his dues and he earned this win today. This was no fluke. Power won from the front row today, the first time that has happened since Dario Franchitti won from the same third starting point in 2010. For the last couple of years, the Indianapolis 500 was won by someone that was not a favorite. Alexander Rossi won a fuel-saving race as a rookie in 2016, then Takuma Sato was a surprise winner last year. Surprise winners are nice every now and then, but if it becomes an annual occurrence – I think it cheapens the race. Will Power was no surprise winner. That will do it for today. There will be no post here on Monday, but I will have my “Random Thoughts” post here on Tuesday morning. After that – I’m taking a break until next Monday after Belle Isle. But please remember to check back on Tuesday morning. Thanks for following along all through the month. Come back Tuesday. This entry was posted on May 27, 2018 at 5:15 pm and is filed under Indianapolis 500. You can follow any responses to this entry through the RSS 2.0 feed. You can leave a response, or trackback from your own site. Will Power deserved the win. It was nice to see him so excited and appreciative of what he finally accomplished. It was a race with a lot of twists and turns and an exciting ending. You come across as a very knowledgeable, passionate fan, and your blog generally reflects your lifetime of experience as a fan of the Indy 500 & the Speedway. (Full disclaimer here: I’m NOT an Indycar fan-after the formation of the IRL and the devastation of US open wheel racing I’ve only a passing interest in it, at best, and a general loathing of it, at worst). Quote: “Surprise winners are nice every now and then, but if it becomes an annual occurrence – I think it cheapens the race”. Wait-how exactly does it cheapen the race? I thought the the current attraction of Indycar was that “anyone can win”. All we hear about it the close racing, where you never know what the outcome is going to be. So, when the unexpected happens, the event is somehow degraded? And if a surprise winner cheapens the race, then what about spec cars, spec engines, spec gearboxes (especially the years where it was all Dallara/Honda exclusively)? Or flushing the traditional qualifying format, and replacing it with what exists now? Or getting multiple qualifying runs, no bumping, 25/8, “wave arounds/lucky dog”, the Indy GP, etc. To me THAT”S what “cheapened” the race, not the fact that a “non-favorite” wins a few times. Your “full disclaimer” cheapens your comments. I’ve posted here before, and watched as you, and others denigrated me for being a CART fan. So, now I get that bothersome (to fools like you) fact out of the way, and you still can’t address the comment directly. So I guess you agree with George; the non-favorite/unexpected winner “cheapens” the race? Then why run the event at all? Let the reporters, bloggers, “journalists” etc pontificate on who(m) should win, then just award the trophies and go home. No one gets hurt, no cars get damaged, no time is lost in traffic. etc. For me there’s a big difference between “anyone can win a given race” and “it’s a crapshoot who will win the race”. For the first comment it’s because the cars are similar and the talent is strong, it’s hard for one person to really walk off with things. For the second, the last few years of the 500 have been a bit of a crap shoot due to the excessive slipstreaming where the lead was changing every other lap and most people were just biding their time until the last 5-10 laps. That second scenario has as much to due with luck as talent, the first scenario is far more due to talent than luck. This year’s 500 took a lot of that randomness out of the equation and put some of it back into the drivers’ hands. For a comparison, imagine 10 NASCAR teams show up at Martinsville and all look very strong all weekend, you could say any of those 10 have a chance at winning. Now go to Daytona or Talladega, anyone can win there because it’s a total crapshoot as to who is out front at the end and has little to due with how strong a given team was that weekend. At least that’s how I see it, hope that made sense. What a fantastic Sunday for Australian Motorsport the greatest in a long time!